We named this little guy Snuffy. 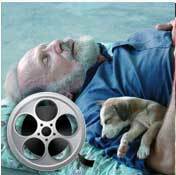 He was found on the streets of Chennai. Alone. Uncomprehending. Frightened. Hungry. With a terrible skin condition. He was about 1 1/2 months when we got him. He had been taken in by a lady that you'd love. She has a cat shelter. And a massive Heart which sometimes does her in--Sound familiar? 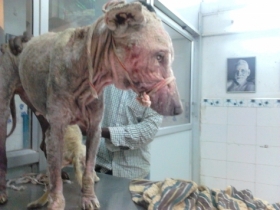 She was taking him to a Chennai vet that wasn't making much headway with the skin condition. And poor Snuffy was very sad. She asked if we'd take him as a special favor. And so he was sent to us in A CAR. That makes him a 3500 rupee puppy! Vishwa saw these two sweethearts on the street and brought them in. Dr. Raja treated them, and sterilized the mother. Vishwa then returned both of them to where he found them. This is very unusual to put a puppy back into its territory. What made that possible is that there were a number of families who adored them and were taking care of them. This guy's name was Ramu. His territory was around the big Shiva temple in town. I was riding by one day and spotted him. I called Vishwa. It is amazing how Vishwa is able to catch dogs and reassure them so quickly. The energy coming from his heart is like a blast from a large furnace! This little darling was only several days old when the owner brought her in. She had a large congenital stomach hernia. Our beloved Dr Raja operated, and released her to the owner. This little dear was an “owner puppy”. He was 6 weeks old. He had been hit by a vehicle. The owner brought him to the clinic. His back was broken, and his face was swollen.